It's been a long time since I've scheduled a new gig... a long time. It has been so long that I didn't even know how to go about it. So I asked around, got some suggestions of places to approach from a few friends, and just bit the bullet, so to speak. I'm still biting it, and so far, I've gotten a few bites back. Good bites! My first new gig is tomorrow night at Urban Vines. I'm super excited. I've dug out some old songs of mine- and actually had to figure out what tuning they were in and how to play them as if someone else had written them! I've also brought back some cover songs I hadn't played in a long time- Plus some new ones that I just learned. AND, I've polished up a few newer songs so they just might be ready for their first public appearance. It's been such a fun process getting myself ready and brushing up on things. Please pop over tomorrow night. The menu there looks great, and Thursday nights are half off on glasses of wine. And music, provided by me, is from 7-9pm! For well over a year, I've intended to visit my friend's family owned guitar shop. I can't believe it's taken me so long to go- but it has. So this past weekend, I was determined to get over there and check it out. As an added incentive, I wanted to see if they could sell one of my guitars for me. I have 5, and although that certainly isn't a huge number, it's too many for me. The one I decided to sell is a beautiful Alhambra classical guitar that stays in it's case, in my closet. 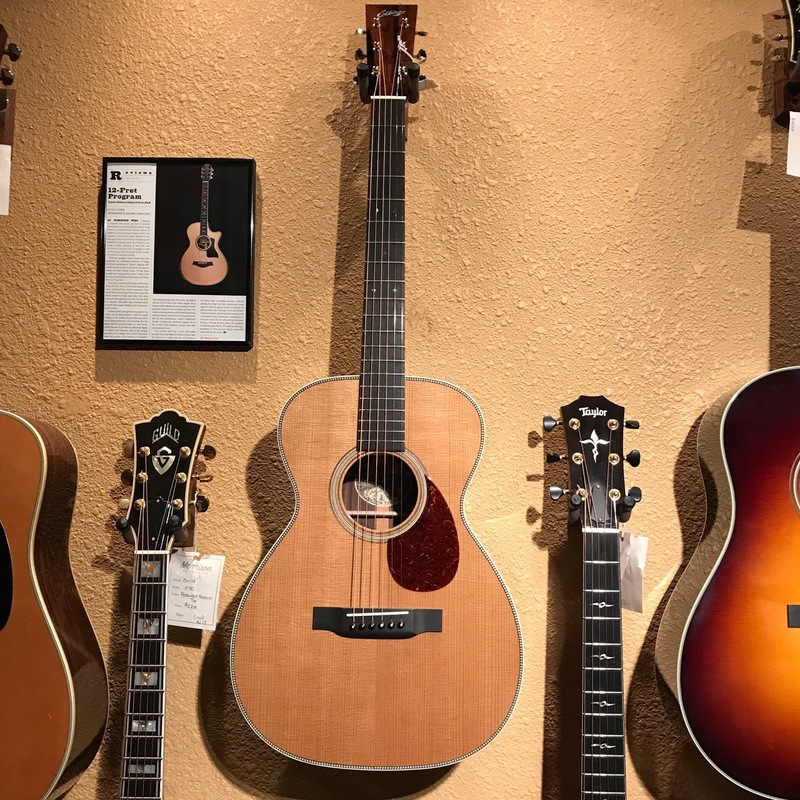 It's too nice of a guitar to just sit around, not getting any attention. Friday night, I asked Fermin if he wanted to go with me the next day, and fortunately for me, he said yes. When Saturday rolled around, I wasn't feeling great. I had a headache (maybe due to the 2 glasses of wine I had the night before, because I so rarely drink and when I do, there is usually hell to pay even from the slightest amount! ), my blood sugars kept falling, and I was just feeling meh. Had I been going on my own, I probably would have put it off for another day. But as soon as Fermin got home from the gym he said, "Let's go! "And so, we did. We stopped and had nachos at a nearby restaurant and I pretty quickly started to feel a little better- because that's what nachos are for! We went to the guitar shop- Morrison's Guitar Shop, and OH. MY. QUESO. It was so beyond my expectations- and honestly, I had pretty high expectations! 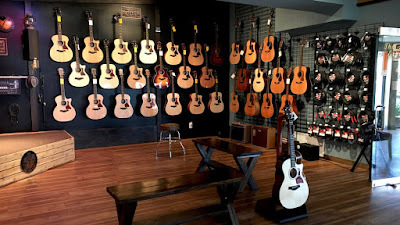 The shop was beautiful, and it had a huge and impressive collection of acoustic guitars. (They also had a lot of electric guitars, but that's not my thing, so I really can't speak to that. But you can go check it out for yourself!) They have a stage and a nice sound system you can plug into. And so, when I was asked if I wanted to, OF COURSE I said yes! That sweet little guitar has a small little body, and the volume and sound of a much larger guitar! I think it was made for me. But wait! 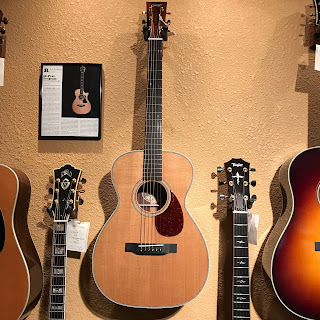 I went there to SELL a guitar, not to buy one! I did start thinking though, "Hey, if I sell my Alhambra, plus two of my Taylors (eventually! )- I could actually do this..."
Who knows. It's always good to have goals, right? Maybe someday. But for now, I know where this guitar lives. And I might have to go visit her on a weekly basis just to say hi. If you live anywhere near Rockwall, Texas- you really should check this place out! 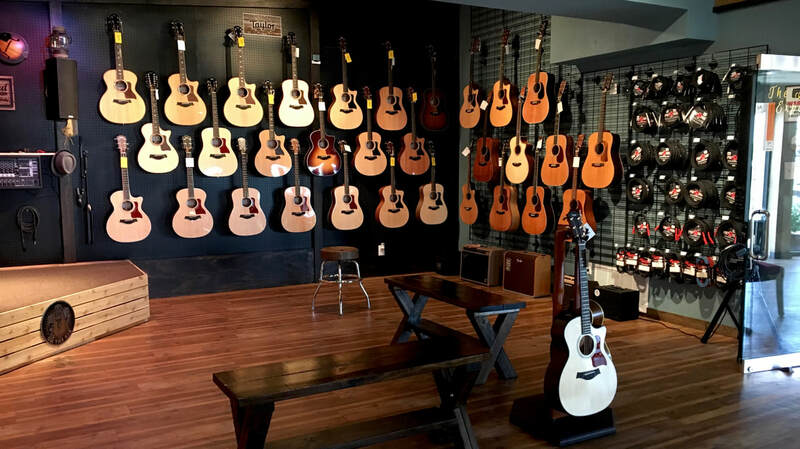 Locally owned by the nicest people, WELL stocked with gorgeous guitars, and as a bonus- it cured my headache and stabilized my blood sugars for the rest of the day. I left there feeling a million times better than how I felt when I walked in.